Discussion in 'The Bar' started by DryOatmeal, Sep 7, 2010. JameGumb and Magnificent Mr. Hole like this. That was my first first post in a second hang out thread!!! Can i hang with you fellas until the benadryl kicks in? 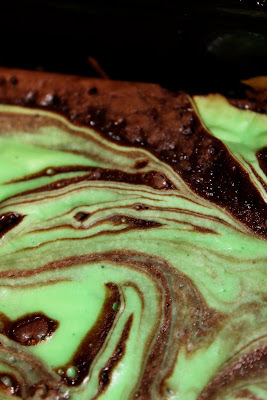 Preheat the oven to 350 F. In a large bowl, mix together the brownie mix, oil, water, 2 eggs and mint extract. Pour it into a greased 8 by 8 inch pan. In another bowl, mix together the cream cheese, sugar and remaining egg. A handheld mixer would probably be best. Then add the refreshing Nyquil or substitutes. Mix it together until it is nice and green and minty and drowsy. Dump the cream cheese mixture in the center of the brownie batter. Take a butter knife (mixing sharp objects and sleep medication is not a good idea) and artfully swirl the cream cheese around the pan. Bake it for about 45 minutes, slice it up, and when you wake up it will be a brand new week. I despise Nyquil. It works great, but the taste...just reading the word "nyquil" makes me queasy. wouldn't the baking burn out the alcohol?? anyone ever try these? ??? Why were you driving so much? Has the move started? Hey DryOats! Nice to see you here!!! very last minute changes. Had to drive 4.5 hours to where i used to live, then 2.5 hours to New Orleans, then 2.5 hours back, then 4.5 hours home. the real fun begins thursday. 6 hours BACK to New Orleans, then Friday, 22 hours to NYC! If you were the Bandit, that would have been fun. As you're not, you have my condolences. heck, if i had a nice car, it might have been fun. I am so stiff I can hardly move. I've had that problem before, but for me it happened in 8th grade Spanish with Mrs. Castanada. hahahahaha good one. You would think that with more than 20 years as a Stern fan, I would know when I am opening myself up to such comments. I'm getting droswy. I took a picture of that stylus/tablet thing i got and tried to send it to you. I was wondering if I got the right thing. Did you see it?